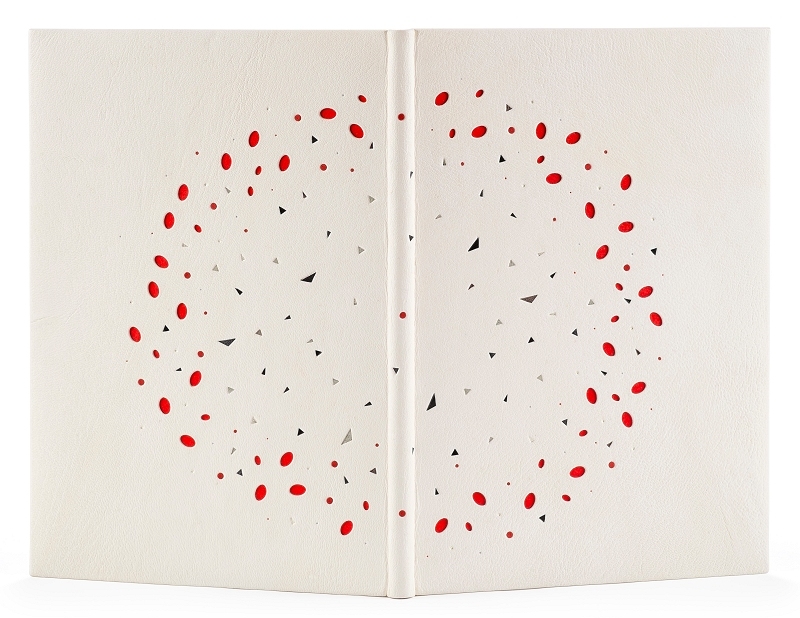 Bound in alum tawed goatskin pierced with ovals revealing red coloured boards underneath. Triangular onlays in various shades of grey. Tooled with white gold and coloured foil. Grey Ingres paper doublures and flyleaves with pierced ovals revealing red ingres paper underneath, tooled with red and grey dots. Red and light grey Ingres paper endpapers. 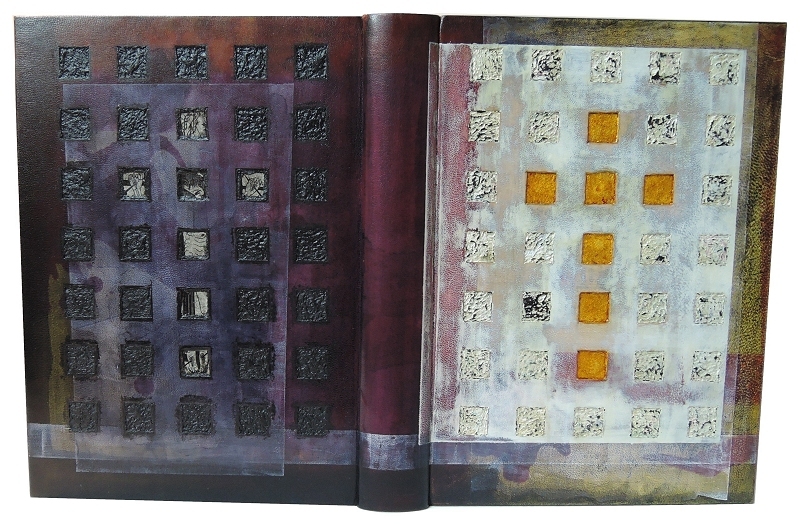 A hand dyed full leather binding with multiple inlays of gold, emulsified leather and mixed media. "The Golden Cockerel edition of the 4 Gospels rates as one of the most beautiful books to have been printed. When I was a student (many years ago) I had the chance to not only see a copy but also to handle it. The Print work was dense, a true black if you like. The marriage of text to print harmonious. In short, a delight. When I was informed of the value of the book, well, it was one of those sit down moments. Worth every penny but well beyond my means, however, the seed was sown. That was nearly 25 years ago. The seed lay dormant, waiting for the right moment for growth to begin." "In 2010 I stumbled across The 4 Gospels, no, not the Golden Cockerel edition but the Christopher Skelton reprint. As I flicked through the pages, distant memories began to whisper, the quality of paper, the richness of the ink. I felt the first kick of the seed as I realised that in my hands I held no poor copy. Time and attention to detail, the paper felt correct, all began to fall in to place. That was 5 years ago." "Slowly the design began to take shape. I wanted texture, no dainty work but carved, as if hewn from rock and wood. Colours to be washed, aged like an icon, light and dark representing a life, a journey, a beginning and end. Simple, yet with depth. More, it had to reflect the contents of the text block with out conflict or pedestrian answers . Design can take time, in this case some 4 years. Time spent understanding the text, drawing from it and myself." "Once I had the key elements of the design and materials I could begin work. First, the end papers and doublers, deep black, rolled out, crossing time and again forming a myriad of crosses, overlapping, creating areas so dense that no light is seen, whilst countered and balanced with subtle half tone." "I tend to use Fair Goat for my binding work, dyeing and colouring on and off the binding as I wish, extending my pallet of colour. The binding becomes my canvas. I tend to work on the one book at a time and it is always on the bench. To this end the students can see work in progress and the various stages of my work. Having students means I do not work in isolation, they ask questions about reason, technique, method and realisation. This is healthy as I have to be sound in all aspects of my work and approach, I cannot not answer or give groundless answers, nor can I just repeat (my students are very perceptive)." "The finished binding reflects my initial design concept, aspects of stylised Greek and Byzantine iconography, the depth of colour and texture pulls the eye into the binding and beyond. The constant fight of light over dark."